This is not ideal yet and in my opinion I still need to improve it, but it's decent enough to let you guys look at and hopefully give me some feedback on (you don't have to, but it'd help ^.^). Sebastian heaved a soft sigh and laid back against his pile of blankets. The rush of adrenaline that kept him running for his life not too long ago had completely left him, giving way to aches and exhaustion. The small flame crackling in the fireplace didn’t look like it would last all night, but it was doing its job just fine for the time being. The warmth in the air combined with the vapors emanating from the open liquor bottle formed a mist in the boy’s mind, almost comfortable enough to make him forget everything. Right now, Seb just wanted to sleep or, at the very least, pass out. Kyle’s question took a small moment to register fully, but once it did, Sebastian let out an aggravated snort and nodded in confirmation. He had already told his brother all the details of his daring escape. With the adrenaline pumping and his heart still pounding in his chest, he’d felt extremely proud of it, but in the warm hazy aftermath of it all, his amusement was starting to fade. “There was a small chance he’d jump over it. I decided to be optimistic,” he muttered. “I guess...” Sebastian frowned, glancing at his nearly-untouched cup of liquor and considering whether to give it a second chance. The stuff tasted like what he would describe as fiery piss. It was bitter and burned all the way through. Kyle had grimaced and groaned, but swallowed it down nonetheless, probably just to prove he could take it. Seb had taken one sip and immediately called it quits. Never mind this had been his idea; he wasn’t too proud to admit it was terrible. Still, just the vapors alone were making his eyes blur and his mind drift into a pleasantly empty state, and Sebastian couldn’t deny the appeal of burning his insides if it meant slipping away just a little bit faster. In the end, he concluded, it was probably not worth putting his body through any more ordeals that night. “I just wish it had gone another way,” he concluded. “If it had, maybe he would have caught up with you,” Kyle pointed out, taking his brother’s discarded cup and emptying it in one large gulp. “That’s a possibility,” Sebastian mumbled. He was doing his best to keep his eyes open, if only for his brother’s benefit. He watched the flickering shadows cast across the ceiling in an attempt to keep his mind in the present, but it was proving difficult. “But then maybe not,” he added under his breath. “Do you think it’s past midnight already?” Kyle’s question was casual, but the bitter edge in his voice was very noticeable. Even if it hadn’t been, Sebastian knew what he was thinking. “Probably. Birthday over,” Seb responded with a heavy sigh. Sebastian snorted a chuckle. “If she was here she’d probably argue that this place just needs a little decorating. We’d be making little paper flags and hanging them on the ceiling... Paper flags fix everything,” he mused, draping his left arm over his eyes to shield them from the firelight. “Not everything...” Kyle answered, pouring himself another drink. Sebastian gave no answer and soon his breaths resonated in the small living room, slightly uneven but overall peaceful. It was clear he’d finally succumbed to exhaustion even before his brother could finish his thought. The amused smile on Kyle’s face slowly melted away and he let a long deep breath escape into the warm stale air around him. The silence had fallen thick, he was far from feeling tired, and there might not be enough alcohol in Blackpond to drown out some particular thoughts. The numbing effect of the first few shots of liquor was fading away at an alarming rate, giving way to a burning ache in the pit of his stomach. He felt sick for reasons completely unrelated to how much he’d already consumed, he felt a sickness he knew wouldn’t disappear in the morning. In almost a year, it hadn’t left him and, at this rate, he felt it probably never would. His hand was shaking on its way towards the liquor bottle. He didn’t want to think about it; the fact she wasn’t there, that they would never celebrate another birthday together. It was too much. It felt like a knife gradually sinking into his side, perpetually twisting at every mention of her name, every thought of her. It felt like poison tainting the memory of everything that used to bring him joy. Kyle had tried. He had tried really hard to remember Katherine the way she used to be; the way she was supposed to be. It didn’t work. He knew his sister’s eyes were golden-hazel; like their mother’s had been, but he couldn’t remember seeing them open. He knew that her cheeks flushed bright pink when she laughed too hard, but every time he picture her face now, it was drained of all color or feeling; white like a porcelain mask, eyelids stained crimson from having been pulled shut by bloodied fingertips. He knew that she always laughed a bit too much at the stupidest little things, but the sound of her laughter was slowly fading from his memory, more and more distant, no matter how much he fought to hold on to it. He knew Kat had been a joyful, smart, caring, living breathing human being, but he could no longer see her that way. That aspect of her no longer existed. Not even in his mind. Not even in a distant point in time where he was still able to experience happiness. So instead of trying to force himself to remember, Kyle just sat on his pile of moldy blankets and, one cup of liquor after another, tried to make himself forget her altogether. Just for one night. Just so he could sleep in a comfortable void where her ghost couldn’t reach him. But that didn’t work either. The harder he tried to push the thoughts away, the louder they echoed in his mind. Kyle squeezed his eyes shut when the walls started to sway, only opening them when he realized his breaths were growing more shallow by the second. In some distant part of his mind that was still rational, he worried that he might just start screaming. Because he wanted to scream. He wanted to scream until all air left his lungs and his voice faded into nothing. Incoherent, desperate, screaming was the only form of communication he still felt capable of. Everything was spinning. The air felt way too stuffy and the smell of rot from the blankets and walls was suddenly making him sick. Kyle swallowed hard when he felt a bitter taste trying to claw its way up his throat and decided he couldn’t sit there all night. He needed to breathe. He needed out. In the center of Blackpond, close to where the main streets of each district intersected, right by the center square where the merchant stalls were set up each morning, burned two bright orange squares of light. The only traces of life, or warmth, left in the city of Blackpond. They irradiated from inside one particular three story building and, drawn to it like a particularly stupid moth to a particularly destructive flame, was one intoxicated teenage boy. The two orange lights were swaying in front of his eyes, blurring in and out of focus, and occasionally flickering in and out of existence altogether. Kyle reached out and found a wall to steady himself against, the empty bottle in his right hand clanking against the stone. They were only specks in the distance earlier, but now he could walk across the street and be close enough to touch them. Or, better yet, shatter them. The boy glanced at the bottle in his hand. It was empty but still heavy enough to smash a window. The thought brought a smirk to his lips and he pushed himself away from the wall with newfound determination. It was a miracle he didn’t end up face-planted on the stone pavement. Kyle inhaled a slow deep breath and exhaled a bitter laugh. His sister would never approve of this. No, Kat would never approve of even the smallest act of vengeance. She was too good for something like that. But he wasn’t. Not anymore. Nodding vigorously to himself, as though settling a debate that occurred solely within his mind, Kyle held the bottle tight and swung it back over his head. His balance was off, way off, and he stumbled a couple of steps backward as a result but was somehow steady enough not to fall over. He swayed a little, trying to take aim at one of the windows of the inn through blurred eyes. When he thought he had a firm grasp of where his target was, he swung his arm a bit further back, channeling as much strength as he could muster into his throw only to have it thwarted by a hand firmly gripping his wrist. Sebastian heaved a sigh. “I know, Kyle. I know, but... This is the Wolfpack you’re talking about. They’re untouchable. We can’t hurt them. Going after these people, even just their windows, is suicide.” It wasn’t the first time they had this conversation, it probably wouldn’t be the last, and it always devolved into fighting, but something was different this time. Seb could feel it burning in the air between them. Kyle tried pushing past Sebastian, this time finding it a bit more difficult to escape his twin’s hold. Neither of them was particularly strong, they were both exhausted, but Sebastian was fully sober and knocking Kyle back against the wall was only a matter of giving him a well-placed nudge. “Get off me, Seb!” Kyle sneered, struggling when Sebastian pinned him to the wall by the shoulders. This time, when Sebastian tried to push him back Kyle was fast to swing a fist straight into his face without a hint of hesitation. Sebastian was knocked back a step and doubled over holding his face in his hand, hissing at the pain and wishing he drank a bit more earlier; maybe that would have made it a bit more tolerable. “Shut up... STOP!” Sebastian’s voice carried and he could swear there was a small fraction of a second where the noise coming from within the building faded in an out. Before another pointless word could leave Sebastian’s mouth, a cloaked figure dropped from the tavern’s roof. A tall cloaked man landed between the two brothers with a heavy ‘thud’ and immediately knocked Kyle in the back of the head. The fire extinguished from his hands and the boy collapsed against the stranger, who didn’t hesitate to haul him over his left shoulder like a sack of potatoes. Sebastian shook his head in utter confusion at the sudden and unexpected turn of events, not being given the time to question or protest, instead just staring dumbfounded at the man walking past him with his twin slung over his shoulder. “Move, boy. You don’t want to be caught idling in this place after the commotion you just caused,” he muttered over his shoulder. The man didn’t stop or turn to check if Sebastian was following and it seemed he had no choice but to run and catch up to him. It didn't matter this was a strange man who dropped from the roof of a building. It didn't matter who he was and where he intended to lead them. At this point, as far as Sebastian was concerned, there was absolutely no way this night could lead to a greater disaster than the one he almost witnessed. Kyle drank about 5L of really potent liquor and yes; that is enough to kill an adult man. However, enlightened are far more resistant to certain things like exhaustion, intoxication, and disease. It's not going to be explained because I don't currently have a character in this who knows about this stuff enough to explain it, but this is the only reason he survives this whole thing. Gerald (roof man is Gerald, sorry, spoiler >.>) does jump down from the roof of a three story building lands on his feet and doesn't break any bones because his enlightenment allows him to do so (if it's not a huge drop), this will get brought up later. As for feedback... Anything that stands out to you guys, any comments and opinions help. My main concerns with this scene were emotional depth and pacing. So any thoughts on how effective it is on getting the emotional state of the twins across and on how the writing actually flows will be extremely appreciated. Because I'm definitely not 100% on it yet. So, that went better than I expected. I was totally expecting Kyle to light the place up and I was really tense waiting for that to happen. I think the pacing is good and you clearly get Kyle's emotions out there regarding Kat and the Wolfpack. I'm less sure about how well Sebastian's emotions are shown (though, granted, the chapter focuses more on Kyle than Sebastian), at least in regards to the things that Kyle was dealing with in the chapter. The panic of Kyle being an idiot is good, I think. I will say, Sebastian's reaction to Kyle trying to antagonize the Wolfpack with the bottle is good foreshadowing of how powerful the Wolfpack is. And how large? I didn't realize they were large enough to operate an inn? I thought they all just ran around in the woods unless they had a job? I think where I could get a really good understanding of Sebastian's character in the first chapter, that's what was given here for Kyle's character. Okay, any useful feedback has been exhausted because my brain is refusing to get into feedback-mode. Just knowing how hard it would be for me to write a scene infused with this much emotion and write it well, I can see why it took so long for you to finally get to a point where you felt like it was any good :) In terms of writing flow, the only thing that really stood out to me was when Gerald jumped from the roof. The repetition about a cloaked figure threw me off. I know it's really nit-picky but it's the only place where I can explain why I had a problem with the writing flow. I understand that it's probably going to be explained in the next chapter, but I'm impatient. Why was Gerald on the roof? The Pack is wealthy enough to run an Inn. Two, in fact; one in each city, but the Inns are practically a point of contact and a rest stop. The bulk of the clan does run around in the woods unless they get a job. And, as Gerald will later explain, there was a total of five Wolves at the Inn at this time. Literally everyone else inside the Inn was an innocent civilian. Regardless of repetition, I need to go back and actually do a better description of Gerald than 'tall cloaked man', seeing as this is his character introduction after all, but at this point I was already in 'ugh, just let it be over' mode. Gerald was there because he was waiting for one of them to leave so he could follow them to their next assignment and kill them dead. And you'd think they'd secure their rooftops, but nah. About Seb, I did have a scene of him waking up and realizing Kyle was gone and tracking him down, but I felt it kind of disrupted what I had going with Kyle and cut it. Likewise, this was initially written entirely from Sebastian's POV and it made Kyle look like a horrible terrorism-prone jerkface. And, as Gerald will later explain, there was a total of five Wolves at the Inn at this time. Literally everyone else inside the Inn was an innocent civilian. Well. That would've been awkward. While I understand their needing to be something a little more descriptive than 'tall cloaked man', I'm also wondering how much can wait until the next chapter when Seb is freaking out less. On that note, I'm wondering if Seb would necessarily notice anything beyond a 'tall cloaked man' at the moment Gerald is introduced. You know what I mean? And you'd think they'd secure their rooftops, but nah. I can understand this, though. If they don't have regular people actively staying at the Inn and they've never been attacked at the Inn before, there's really no reason to think, "Hey, maybe someone is going to sneak onto the roof and stalk us from there!" That comic is the story of my life. 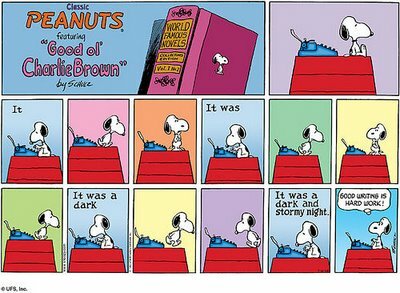 Also extra brownie points for Snoopy. The only description I can think of is "[insert adjective of choice], faintly glowing cloaked man". Or however the glow works. Or you could try to work it in after his one liner? If I had remembered the building was three stories tall, I probably would've also been asking that question, but by the time I got to the part where he was jumping off the building, I forgot. I realize I said 'under the cloak' instead of 'under the hood' when referring to the glow in Gerald's description which made for a very comical mental image of him lighting up under the cloak like when you turn on a flashlight under a blanket or something. But since it's only his eyes, I'll likely just add something when he talks to Seb. That makes sense. I have a bit of work this week, but I am so going to be reviewing this and giving it a proper beta feedback response for ya as soon as my schedule allows it! Two things: could you send me a link or something to chapter one, and would you mind if I copy and pasted the chapter into a Google Doc or something, put comments on it, and then sent you the link/emailed you the file? I've found it's easier for me to give feedback that way. I think you've got a strong chapter. I wondered when you called him a 'boy'... it felt young. But since this is chapter 2, the reader probably already has a firm grasp of their ages by now. So it's no big deal. I like how you described him remembering his sister's face. Just the right amount of emotional twinge. Watch out for repeated words or phrases. I think you said 'gave way to' twice really close together. Things really picked up nicely toward the end. I would definitely turn the page! @toasha Sebastian and Kyle are established to be thirteen in chapter one, but as a personal rule, I do use 'boy' and 'girl' for characters under the age of seventeen.